Visions In Voice - "Accepting Death"
I interviewed a man who lost his brother to cancer, edited it, and produced a feature about death for Red River Radio's "Acceptance" themed episode of Visions In Voice. I wrote this story (with my group members contributing some changes to the script) and voiced the role of Cole. I also sourced all the sound effects, and produced the final edit after we all worked on it in ProTools. WARNING: Contains some foul language. 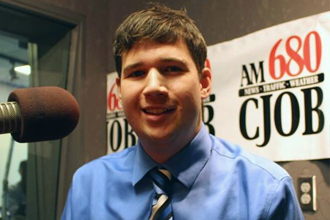 I wrote and produced this "People Making a Difference" feature for the legendary 680 CJOB in Winnipeg. It first aired December 16 and went into rotation for the holiday season. Working Easter Sunday, a train derailed in St. Norbert, outside Winnipeg. I zipped over to the location and reported live for 680 CJOB.